2010 November 22 » Embroidery Talk Has Moved! Call them the Terrific Twelve. The Dynamic Dozen. Whatever name you have for them, they’re the thread colors you use most often and the ones you need to purchase the most. 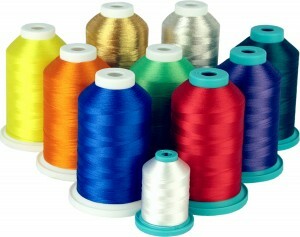 They’re also the first ones you need to convert when switching from one thread manufacturer to another. We’ve talked before about the fact that thread conversions aren’t always fun. We also know that each embroidery business will have a slightly different Dynamic Dozen, so a one size fits all conversion chart may not be much help. To assist you in converting your particular Dynamic Dozen, EnMart is now offering a Dynamic Dozen Conversion Chart created specifically for your business. Just let us know which twelve colors you use the most and we’ll convert them to Iris thread, while creating a unique conversion chart just for you in PDF or Excel format. If your Dynamic Dozen is fairly standard, you may also want to check out EnMart’s Dynamic Dozen conversion chart, which we offer in PDF form. This chart contains all the standard machine embroidery thread colors, including black, white, red and green and is available in both Iris UltraBrite Polyester and Iris Smooth ‘N Silky Rayon. All Dynamic Dozen charts that we create will be kept on file here in the EnMart office. This means that every time you need to place an order, you can just call and tell us your company name and the color you want to order and we’ll pull the correct number off your Dynamic Dozen list. This list can also be stored next to your computer or embroidery machine for easy reference. Thread conversion doesn’t get much easier than this, so call today for your Dynamic Dozen thread conversion chart.